EvanTheGamer: Dead Space is gonne be one hell of a ride! Dead Space, the newest in survivor-horror games. The game has been getting some great reviews and those who have actually reviewed it are saying it's extremely scary and bloody/gory(my kind of game). This could have easily been hit or miss, seeing how this is a new franchise developed by Electronic Arts. Who would have known if they could pull it off or not. But it appears that they have. GamePro.com (5/5): "Dead Space is a riveting survival horror game, unflinchingly violent from start to finish. Blindly unpredictable and incredibly intense, Dead Space keeps your heart pumping the entire game." 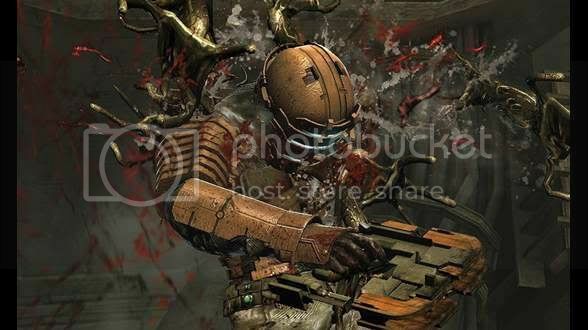 PGNX Media (9.3/10): "Dead Space shows the beginnings of a very strong franchise. EA Redwood Shores nailed the genre with Dead Space. On one hand, you have a very violent and gory game with tons of action. On the other, you have a fulfilling and well-told story with plenty of plot twists. Holding them together is a superb atmosphere that truly immerses you into this world. Essentially, you’re looking at a must-have." GameSpot (9/10): "An incredibly atmospheric and disturbingly gruesome deep-space adventure that will haunt your dreams and leave you begging for more." GameDaily (9/10): "Proof that space travel is a bad idea unless it's in a video game starring scary aliens with overbites." IGN: (8.7/10): "Call it science fiction survival horror, but Dead Space does the genre proud with an engaging story; action that's tense, fast-paced and extremely violent; as well as atmospheric qualities that will get under your skin and make you jump." There you have it folks. All in all, Dead Space is an easy BUY NOW, not later type of game. It arrives on store shelves this Wednesday. And just a reminder, when you get the game, be sure to crank up the speakers, turn off the lights, and be ready for one hell of a ride that will scare you until you suddenly wake up.